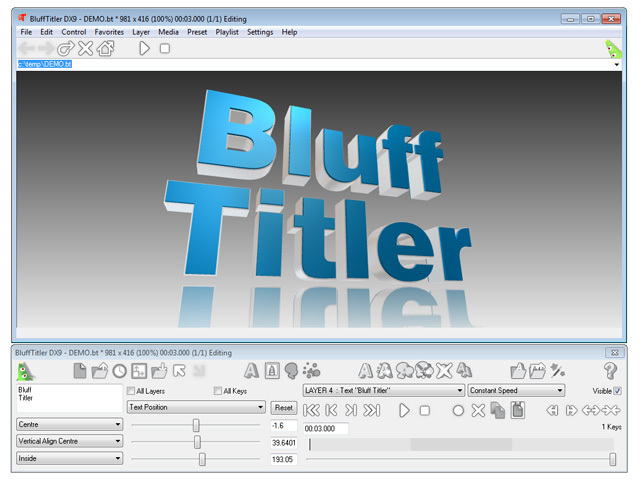 BluffTitler DX9 is a realtime 3D video titler. The result can be played in realtime or exported as a movie file for further processing in DVD authoring tools. Special effects include: reflection mapping, light beams, beveled borders, looping plasma effects, realtime shadows, EPS import, particle effects, bump mapping, RSS news feed import, vertex and pixel shader effects, spinning globe, waving flag, blob rendering and MPEG/Flash video textures. Qweas is providing links to BluffTitler DX9 8.4.0.2 as a courtesy, and makes no representations regarding BluffTitler DX9 or any other applications or any information related thereto. Any questions, complaints or claims regarding this application BluffTitler DX9 8.4.0.2 must be directed to the appropriate software vendor. You may click the publisher link of BluffTitler DX9 on the top of this page to get more details about the vendor.